Me and my best buddy, Jack. RIP, Little Buddy. I miss you. Photo taken by Jordan Fraker in 2013. My name is Poppy, a nickname I accepted from a dear friend of mine. She told me that I reminded her of what she referred to as a “tall poppy,” a person who sticks out from the crowd because they’re willing to say what others aren’t. When it’s used, typically it’s not a compliment; when she used it, she was highly complimentary. I have chosen to embrace it. What better forum for a tall poppy than a blog? I have developed this site for just that purpose–to give voice to my soundings for people who choose to hear them. I’ve found it’s better not to force such soundings on people. The results to the messenger can be disastrous. 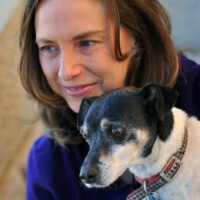 I am a former animal shelter director and avid dog lover. My husband and I run a small business caring for dogs and cats–boarding, house sitting, walking, and training. I have two children who are happy, healthy, and wealthy in so many ways! I’ve been happily married for over thirty years to a man I don’t deserve. I count this blessing as the fount from which all other blessings flow.